Here is one~loving the black and yellow together. Always a great combination. 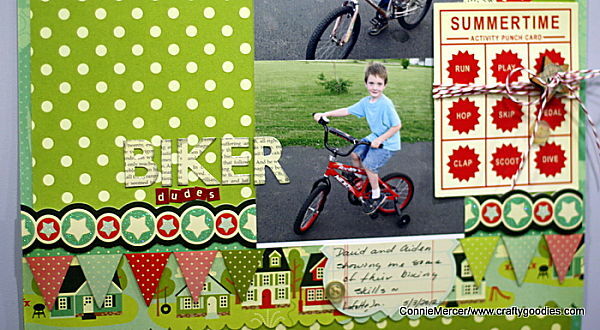 I used Helmar 450 Quick Dry when gluing down the embellishments. I was trying talk computer talk:) ~ at you smiling! 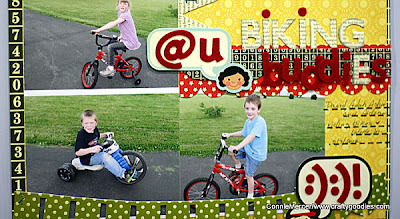 and I know you are thinking ~ wow, great lookin' kids, yes they are and all so sweet!!!! Great colours, great papers, great layout! These are such happy pages, Connie! I love the different ways you used the banners. The tech icons on the second page are way cute! I just love them and the colour combinations are fab! Just saw these on FB and ABSOLUTELY FELL IN LOVE!!! I loveeeeeeeeeee the bright, happy colors, and loving the :) on the second one!!! Just BEAUTIFUL Connie!!!!!!!!!!!!! I love the colors and just plain fun on these pages. OOO can't wait to see your junk. I didn't get anything done this weekend scrappy wise. Oh I love this layout. Such vibrant happy colors- and still guy-ish. :) 6 layouts?!?!?! Way to go!!! Such a happy and colorful page. Love the summertime bingo card. And I got my adorable milk caps in the mail. Thank you sooo much. Can't wait to make something fun with them. Hugs!!! 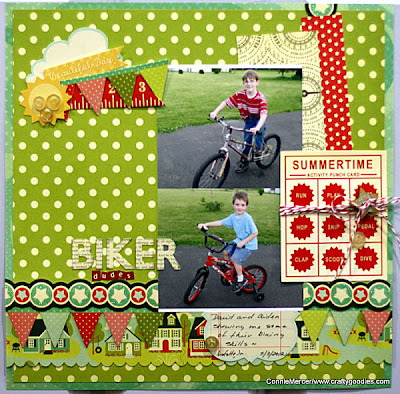 Love the great colors on this Connie, and the fun little Summertime Bingo card! Cute, cute, cute! Love the colors. So vibrant! Great, great layouts. The colors really pop on both of these. I like the yellow and black too! awesome use of colors!!! LOVE! Such vibrant colors!! Love this! I am so in love with those colors, I gotta get some of that goodness!